*Elegant freshwater pearl brooch with beautiful lover swan design. *The mainstone is a 10.5mm white freshwater pearl, very smooth and lustrous. 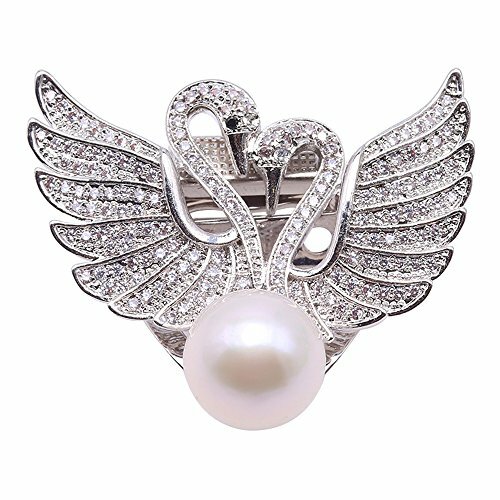 Elegant freshwater pearl brooch with beautiful lover swan design. The mainstone is a 10.5mm white freshwater pearl, very smooth and lustrous. Brooches are often worn on a jacket or blouse with the purpose of dressing up an outfit. By using brooches on a little black dress, the outfit becomes dressy and stylish, even if it is placed at the "V" of the neckline or at the waist. It is also very popular to wear a brooch at the top of a buttoned blouse. Brooches are added to hair, hats, purses, gloves and scarves to make these accessories more fashionable. Pearl Customization ia available. Any question or request on our pearls quality, size, setting, metal type, please feel free to contact us, we are always here to help you.